Kick off your visit on the 12th (Sun): explore the activities along Ord River, view the masterpieces at Zebra Rock Gallery, then explore the wealth of natural beauty at El Questro Wilderness Park, and finally stop by The Sandalwood Factory. On the next day, explore the wealth of natural beauty at Mirima National Park. To see more things to do, maps, photos, and more tourist information, you can read our Kununurra holiday planner . Darwin to Kununurra is an approximately 4-hour flight. You can also drive; or take a bus. The time zone changes from Australian Central Standard Time (Northern Territory) (ACST) to Australian Western Standard Time (AWST), which is usually a -1 hour difference. Plan for a bit cooler nights when traveling from Darwin in May since evenings lows in Kununurra dip to 20°C. On the 14th (Tue), you're off toBroome. Get a sense of the local culture at The Courthouse Collection and Yane Sotiroski Photography Gallery. Head to Broome Gallery and Short St Galleryfor some retail therapy. Spend the 16th (Thu) wandering through the wild on a nature and wildlife tour. There's lots more to do: stroll through Cable Beach, look for all kinds of wild species at Malcolm Douglas Crocodile Park and Animal Refuge, take in the architecture and atmosphere at Our Lady Queen of Peace Cathedral, and see majestic marine mammals with a dolphin and whale watching tour. For ratings, maps, other places to visit, and other tourist information, go to the Broome trip itinerary planning app . You can fly from Kununurra to Broome in 1.5 hours. Alternatively, you can drive; or take a bus. In May, daily temperatures in Broome can reach 38°C, while at night they dip to 22°C. Cap off your sightseeing on the 18th (Sat) early enough to travel to Exmouth. Exmouth is a town on the tip of the North West Cape in Western Australia. You'll explore and learn at The Ningaloo Gallery and Ningaloo Centre. Visit Turquoise Bay and Ningaloo Coast World Heritage Area for some beach relaxation. There's still lots to do: get a new perspective on things with Boat Tours & Water Sports, indulge in some personalized pampering at some of the best spas, explore the gorgeous colors at Ningaloo Reef, and explore the activities along Yardie Creek. To find reviews, other places to visit, and more tourist information, use the Exmouth online journey planner . You can do a combination of flight and car from Broome to Exmouth in 12 hours. Alternatively, you can fly; or drive. Expect slightly colder temperatures when traveling from Broome in May; daily highs in Exmouth reach 33°C and lows reach 18°C. You'll set off for Perth on the 22nd (Wed). Get outdoors at Cottesloe Beach and Dolphin & Whale Watching. Museum-lovers will get to explore Fremantle Prison and Glen Cowans' Studio at the Roundhouse. Change things up with these side-trips from Perth: Fremantle Markets (in Fremantle) and Caversham Wildlife Park (in Whiteman). And it doesn't end there: contemplate the long history of The Perth Mint, tour the pleasant surroundings at Perth Zoo, contemplate the waterfront views at Swan River, and snap pictures at Elizabeth Quay. Getting from Exmouth to Perth by flight takes about 5.5 hours. Other options: do a combination of car and flight; or drive. Plan for a bit cooler temperatures traveling from Exmouth in May, with highs in Perth at 25°C and lows at 11°C. Finish up your sightseeing early on the 26th (Sun) so you can go by car to Margaret River. Get outdoors at Lake Cave and Meelup Beach. Appreciate the collections at JahRoc Galleries and Holmes a Court Gallery. You'll find plenty of places to visit near Margaret River: The Studio Gallery (in Yallingup), Cape Leeuwin Lighthouse (in Augusta) and Featured Wood Gallery & Museum (in Australind). The adventure continues: awaken your taste buds at some of the top wineries in the area, indulge in some culinary diversions at a local gastronomic tour, savor the flavors at Bunbury Farmers Market, and admire the natural beauty at Swallows Welcome Art Studio. To find where to stay, photos, maps, and other tourist information, read Margaret River trip planner . You can drive from Perth to Margaret River in 3 hours. Alternatively, you can take a bus; or do a combination of train and bus. Wrap up your sightseeing on the 30th (Thu) to allow time to drive to Albany. Escape the urban bustle at Greens Pool and The Gap and Natural Bridge. National Anzac Centre and Albany's Historic Whaling Station will appeal to museum buffs. Spend the 1st (Sat) observing fascinating marine mammals with a dolphin and whale watching tour. 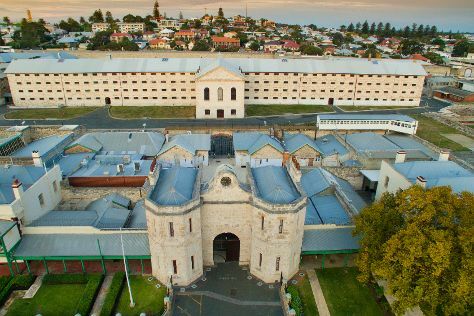 The adventure continues: explore the galleries of Blush Retail Gallery, take in the architecture and atmosphere at The Church of Saint John the Evangelist, and steep yourself in history at The Albany Convict Gaol & Museum. To find other places to visit, where to stay, maps, and tourist information, read Albany road trip planner . You can drive from Margaret River to Albany in 4.5 hours. Alternatively, you can take a bus; or do a combination of bus and flight. In May, daily temperatures in Albany can reach 22°C, while at night they dip to 10°C. Finish your sightseeing early on the 2nd (Sun) so you can drive to Esperance. Esperance is a town in the Goldfields-Esperance region of Western Australia, on the Southern Ocean coastline approximately 720km east-southeast of the state capital, Perth. On the 3rd (Mon), take a memorable drive along Great Ocean Drive, then contemplate the long history of Esperance Stonehenge, then identify plant and animal life at Lake Monjingup Conservation and Recreation Area, and finally take in the exciting artwork at Cindy Poole Glass Gallery. Get ready for a full day of sightseeing on the next day: enjoy the sand and surf at Twilight Bay and then examine the collection at Esperance Museum. 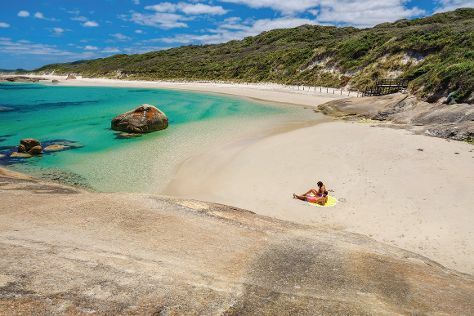 Discover how to plan a Esperance trip in just a few steps with Inspirock's itinerary builder. Getting from Albany to Esperance by car takes about 5 hours. Other options: fly; or take a bus. Expect a daytime high around 20°C in June, and nighttime lows around 9°C. Wrap up your sightseeing on the 4th (Tue) early enough to travel back home.